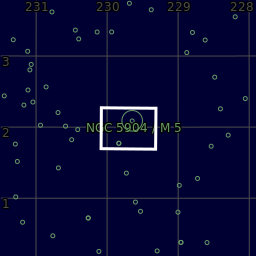 ​M5 is, under extremely good conditions, just visible to the naked eye as a faint "star" near the star 5 Serpentis (upper right). Binoculars or small telescopes will identify the object as non-stellar while larger telescopes will show some individual stars, of which the brightest are of apparent magnitude 12.2. M5 was discovered by German astronomer Gottfried Kirch in 1702 when he was observing a comet. Charles Messier also noted it in 1764, but thought it was a nebula without any stars associated with it. William Herschel was the first to resolve individual stars in the cluster in 1791, counting roughly 200. 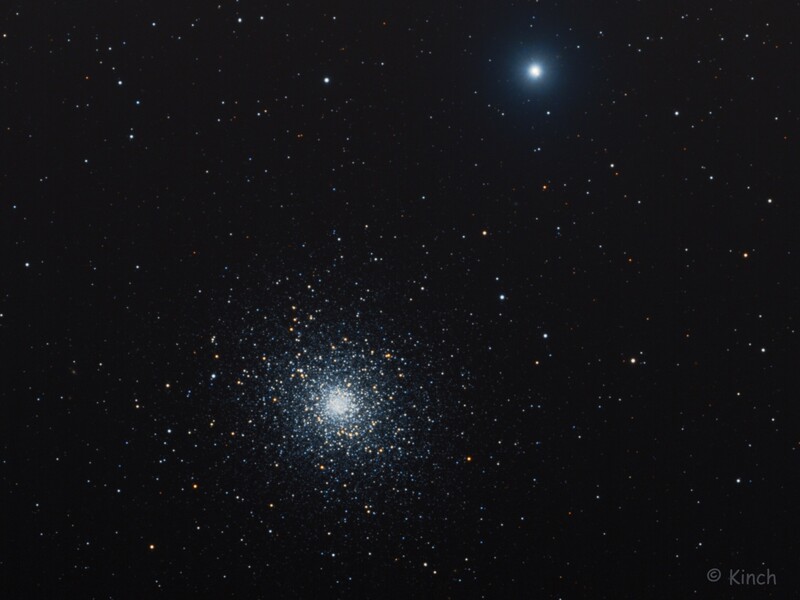 Spanning 165 light-years in diameter, M5 is one of the largest known globular clusters. The gravitational sphere of influence of M5, (i.e. the volume of space in which stars are gravitationally bound to it rather than being torn away by the Milky Way's gravitational pull) has a radius of some 200 light-years. 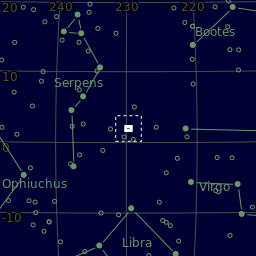 The bright star upper right is a binary star HD 136202 (5 Serpentis). If you look closely at the higher resolution image, you will just make out the 'sibling' star, Ser 5b lower right side & almost hidden by the brightness of Ser 5 behind it. Total integration = 3 hours. Center (Dec, dms):+01° 58' 51.926"